In an effort to clean up the marketplace content available on the Windows Phone, Microsoft has published some information on changes. If you are the owner of a Windows Phone (or any other smartphone for that matter) there can always be a clutter of useless, misinforming applications, but Microsoft is looking to clean them up. Todd Brix, over at the Windows Phone Developer Blog, posted information on the new updates and other changes to the Windows Phone marketplace. First, we’ve updated and clarified our content policies and technical requirements to address some of the common questions and points of confusion that we have heard from several developers. These requirement changes will go into effect on June 3 for new applications and application updates. Second, we have added several test steps to the technical certification requirements to help developers conduct in-house application testing during the development cycle, in order to avoid common certification pitfalls and to improve pass rates and certification times. 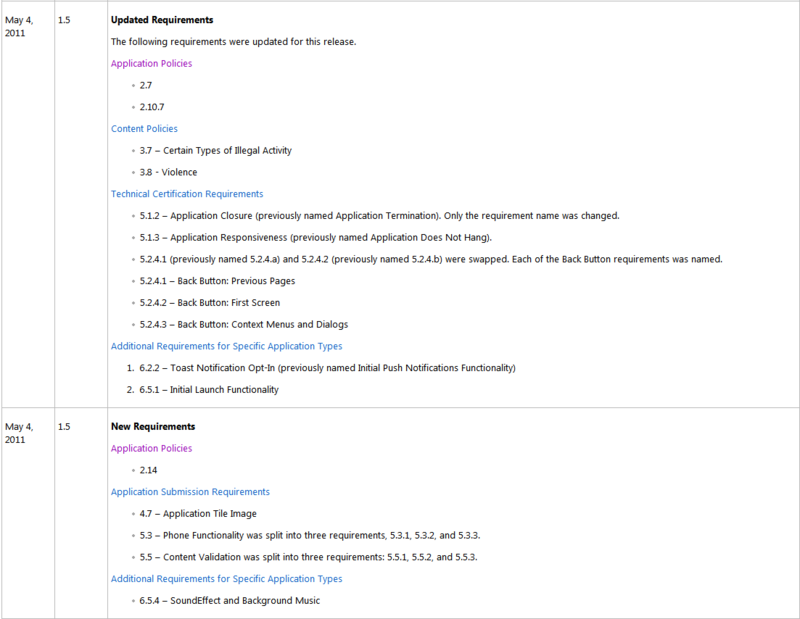 Finally, the application certification requirements for Windows Phone have now been integrated into our MSDN developer documentation. You can find the updated certification requirements here. The updated certification requirements are easiest viewed on the Application Certification Requirements Change History which we have taken a screenshot of and provided below. Of course, you will easily notice that some of the updated guidelines directly target applications that simply load webpages of a website (which will no longer be allowed it seems), have trials that don’t provide enough functionality and other applications that may misdirect the user on what is contained. 2.6 If your application includes a trial version, the trial version must reasonably represent the functionality and quality of the full application. 2.7 If your application includes or displays advertising, the advertising must comply with the Microsoft Advertising Creative Acceptance Policy Guide and the application must have distinct, substantial and legitimate content and purpose other than the display of advertising. 2.14 Your application must have distinct, substantial and legitimate content and purpose other than merely launching a webpage. It’s great to see that Microsoft isn’t planning on letting the marketplace clutter with essentially useless applications. It’s all about quality not quantity, touché Microsoft.